By specializing in ethically-minded legal novels set in the South, it’s not hard to see why North Carolina attorney Robert Whitlow has drawn comparisons to John Grisham. Of course, that’s a little hyperbolic, but still in the same arena. 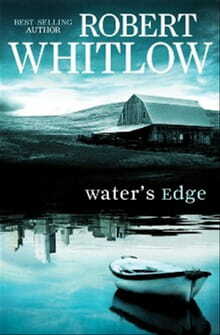 Water’s Edge, Whitlow’s latest, is heavier on the ethics and lighter on the legalese than most of Grisham’s work, so it becomes a kindler, gentler law thriller whose mystery develops at a modest pace under the guidance of a competent hand. It’s a quick, but nonetheless compelling read which asks some real questions about the relevance of an ancient faith in the modern world. The novel follows Atlanta attorney Tom Crane, who in one day loses both his high-profile job and his girlfriend (as well as his cat). He’s scheduled to return home to his hometown of Bethel, Georgia to close out the business of his late father, also a lawyer, and when he gets there, Crane begins to discover some things don’t add up about his father’s last months, or his death in what was termed a drowning during a fishing trip. In the process of investigating, Crane recommits to the Christian faith of his father, thanks to the influence of his uncle Elias, and reawakens a relationship with his high school girlfriend Tiffany. However, Crane’s faith is immediately tested by both the investigation and the new relationship. Through the twists and turns of the plot, Whitlow maintains a good degree of mystery about the outcome of Crane’s investigation. He adds a nice twist near the novel’s end, but it resolves itself a bit too tidily to gain maximum impact. Whitlow wisely forgoes placing the country-vs.-city dilemma which is suggested by the novel’s cover art front and center. Instead, the heart of the story lies not in the legal arena, but the spiritual one. This becomes a more sophisticated conflict. Since Crane’s conversion occurs early, allowing time for him to wrestle with the implications of a total commitment to Christ. Once he returns to the faith of his fathers, he is faced with new dilemmas. These aren’t the standard do-the-right-thing-against-all-odds type of decisions, but more gray. Setting is both one of the novel’s greatest strengths and its weaknesses. Whitlow’s descriptions of northwest Georgia’s terrain and the mood which is created are obviously borne out of experience, and rendered lovingly to give the place an otherworldly quality. One striking example of this is the creation of Austin’s Pond, the spot where Tom’s father died, which takes on an almost otherworldly significance. However, in spots, Whitlow seems to make Bethel a bit too clean. It’s hard to imagine such a place as Bethel, where everyone Crane encounters is decent, and well-mannered, and the food is out of this world, existing in the twenty-first century. It seems like it belongs to another time, which saps a bit of the novel’s verisimilitude. Regardless of this, Water’s Edge remains a success, offering probing spiritual questions and a nice puzzle of a plot. It is definitely directed squarely at a Christian audience, but goes below the surface to pose mature questions for readers maturing in their faith. And its admonition to walk in the “ancient paths” is a timeless message indeed.